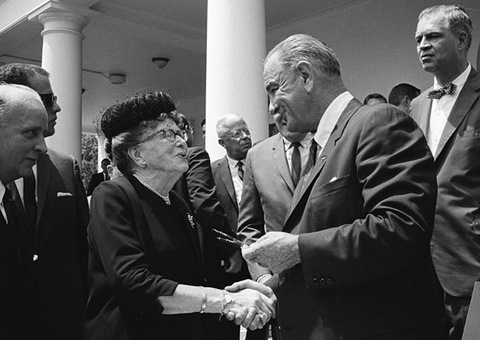 President Lyndon Johnson hands a pen from the signing of the Older Americans Act to an unknown woman on July 14, 1965. Photo by Yoichi Okamoto and courtesy of the LBJ Library. It’s been nearly 50 years since President Lyndon Johnson signed the Older Americans Act (OAA) in the White House Rose Garden. Never heard of it? You’re not alone. The legislation was written in response to concerns that there weren’t enough social services to support our country’s seniors. “The Older Americans Act clearly affirms our Nation’s sense of responsibility toward the well-being of all of our older citizens,” President Johnson remarked at the bill singing on July 14, 1965. The OAA provided for the creation of a nationwide network of area agencies on aging, through which social and nutrition services could be organized and delivered to older people, and assistance provided to their caregivers. So why look back to the past? This week, the PBS NewsHour is airing the first report in series on long-term care in America. We follow Rebecca Wyant, a small business owner from Tucson, Ariz., and full-time caregiver for her mother Mary, who suffers from Alzheimer’s. Her story illustrates how the OAA has remained relevant for communities across the country as the population ages. > Rebecca Wyant, right, is a small time business owner and full-time caregiver for her mother Mary. Photo by Mike Fritz. “The purpose was to have, in every large community, one agency that would kind of be the point agency for any concerns for seniors,” said Suzy Bourque, a caregiver specialist at the Pima Council on Aging in Tucson. It is one of the 629 area agencies on aging established following the passage of the OAA. Today, that network connects people to nearly 20,000 service providers across the United States. “This funding brought in monies for home delivered meals, for lots of services of people living in their own homes, for advocacy for people around legal issues,” Bourque said. In the decades since it was first established, the OAA has been reauthorized, expanded and amended. In 2000 the National Family Caregiver Support Program amendment to the OAA provided funding for assistance to family and informal caregivers to care for their loved ones at home for as long as possible. It specifically funded caregiver specialists like Bourque, who meet with individuals and families to discuss options for and challenges of care, and how to access services. But even though the number of seniors in this country is growing rapidly, according to Bourque, many people are not aware these area agencies exist as a resource, though they exist across the country. Find agencies and services in your area with this interactive map from the U.S. Government’s Administration on Aging. In the past five decades, the pace has quickened dramatically, particularly as baby boomers (those born between 1946 to 1964) become ‘senior citizens.’ Today conservative estimates are that Americans turn 65 at a rate of roughly one every ten seconds. But older people are also becoming a larger portion of the population and living longer. In the same speech, President Johnson noted that in 1900, life expectancy in the United States was only 47 years of age. The National Center for Health Statistics now reports that someone born in 2009 can expect to live 78.5 years on average, though estimates are affected by gender and race. All these facts are contributing to the increasing pressure to support older Americans. Are we prepared to deal with it? Apparently few of us are. A recent poll conducted by the Associated Press and the National Opinion Research Center found nearly two-thirds of Americans over the age of 40 have done little or no planning for their potential long-term care needs, such as setting aside money or talking with family members about how they want to be cared for. The survey was funded by The SCAN Foundation, a nonprofit dedicated to transforming and improving health care for seniors. The organization is also a NewsHour underwriter. These aging decisions can be difficult to broach with loved ones, or think about for ourselves. The SCAN Foundation has developed a series of publications addressing aging concerns, one of which is 10 Things Every Family Should Know About Aging with Dignity and Independence.